If I get to work early enough in the summer, I get to see this. This empty planter holds such possibilities, does it not? the most beautiful greenish blue. I see white flowers overhanging the edges. That looks like Majorelle blue. Gorgeous! That is my most favorite color, and your vision of white flowers hanging over the edges sounds perfect to me too. It is really late...my eyes are heavy with sleepyness, but I missed you. Wanted to come to your space for a quiet moment before I hit the pillows. Will be back tomorrow to catch up...I scrolled down and saw baby owls! In someone's hand!!!! What other amazing things have I missed here? See you tomorrow, lovely one. You're right. We do share so many things. I came back for another look at this gorgeous photo. It's so magical. I'd love to begin my day in this way. I appreciated your comments regarding Elizabeth and blogging. You've been such a wonderful part of our lives during this time, and I often feel like we are sitting on the porch sipping lemonade as we visit. Thank you for your image of blogs in heaven. Before she became ill I taught Mother how to use e-mail. I now have an image of her with my father. They are laughing as she says "Honey, did you know that Al Gore invented the internet?" Daddy says "What's the internet?" That's because he left us in 1989. She says "You've spent too much time fishing. I've got a lot to show you." Perhaps we feel over exposed sometimes when we share these things that are personal. But there's a comfort that comes from letting them go. And then, when we hear from someone that what we shared was enjoyed, or that it allowed them to do the same thing we get the pleasure of experiencing the same comfort all over again. Is that selfish? I enjoy come here because reading what you write affects me. It's time well spent. so pretty, yes, something trailing lavishly down the sides! You know me and shadows! 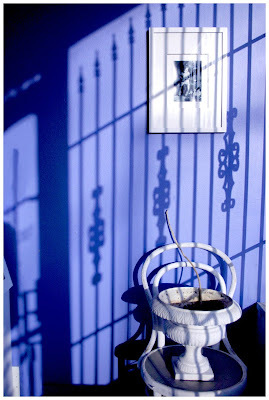 Great shadow shot and yes to the possibilities.